Lately, we’ve been busy conducting stakeholder interviews and focus groups with business owners in downtowns all over the region and a common complaint that often arises is a shortage of parking. No matter where we are, merchants argue that a large number of potential customers and visitors to downtown are not coming because there simply isn’t enough parking spaces to meet demand. But will building more parking spaces really increase retail vibrancy downtown? What about alternative transportation options such as walking and biking that so many cities around the country are slowly turning their heads to, and what about building infrastructure for those modes instead? Biking, as we all know by now, comes with a myriad of environmental and health benefits. However, more recently, it is also proving its worth in bringing economic benefits to commercial districts. Unfortunately, it’s not yet intuitive that paying customers might arrive by bicycle so business owners remain the last supporters of bike infrastructure. Bike lanes, as it appears, do not hurt businesses. 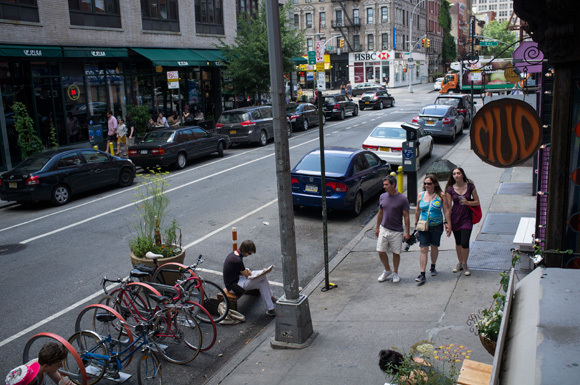 In a study by the NYC Department of Transportation in 2012 that followed various street redesign projects, it was revealed that sales income at locally-based businesses along 9th Avenue, where a protected bike lane was installed, increased as much as 49% between 2006 and 2010, compared to 3% borough-wide. Although the better sales performance cannot directly be attributed to the installation of bike lanes, it is clear that the bike lanes did not negatively impact businesses. Some posit this phenomenon occurs because cyclists have fewer barriers to stopping at a local business than those driving on the same street (Just imagine the hassle of looking for a parking spot for a car versus a bike that can be locked to any old lamp post or corral). However, it is more important that we recognize the overall calming effect that bike lanes provide to our streets. With the presence of bike lanes, protected or otherwise, motorists are forced to be more aware of cyclists on the roads and therefore move at slower speeds. This traffic calming effect then in turn attracts more pedestrians who, like cyclists, have greater freedom to stop and notice storefronts compared to those in automobiles. Although the fear faced by business owners of reducing on-street parking spaces for bike infrastructure may sometimes be unfounded, it is important that commercial districts looking to install bike lanes and corrals, or bike programs downtown engage business owners from the very beginning of the process to maintain transparency and build support among these stakeholders. The Bike Friendly Business District Program in Long Beach, California, for example, did an amazing job in getting business owners involved from the get-go. The program encourages local visitors to bike to the commercial district to shop and dine by growing the number of bike-related businesses downtown and providing bike racks and corrals, bike lanes and clear signage that bolster the pedestrian and cyclist experience of the corridor. In the beginning of the process, the District partnered with neighborhood groups to research how customers traveled to a particular business and shared that information publicly with business owners, reducing common misconceptions about who shops where and how they arrive. By also putting on neighborhood events that encourage people to arrive by bicycle and on foot, and encouraging businesses to offer discounts to customers who cycle, the program has built a bike-friendly business district that today continues to thrive. Narratives about the economic benefits of bike infrastructure downtown may differ from town to town but the key to success lies in involving business owners at all turns of the process and clearing up any unfounded fear of the bike lane. Polk Street in San Francisco, for example, revealed that merchants’ fears of removing parking spaces for pedestrian and bike infrastructure were completely groundless when an intercept survey conducted in 2013 revealed that only 14% of visitors to the commercial street arrived by car. It is also important to note that not all businesses will benefit equally from a bike lane. Furniture stores, for example, may have to adapt more than a cafe because customers simply cannot bike home with a product purchased in-store. However, there are ways to cope. For example, making available cargo bikes for delivery may be one way of adapting – as carried out in Long Beach, CA. Ultimately, the flexibility of a business will determine its chances of survival no matter the change to the district’s physical landscape. If the environmental and health benefits of biking weren’t already enough to convince you that customers are slowly converting to this mode of transportation, consider the calming effect of bikes on your commercial street and its potential to drive greater foot traffic – a new bike corral in front of your store may not be such a bad idea after all!